Some people claim they don’t have time to volunteer and see it as an activity that only benefits others. But the truth is, the benefits of volunteering on the individual are far-reaching and can have a dramatic impact on your overall well being, as well as your relationships with others and career prospects. Experience volunteering looks great on your resume and will help build friendships and communities that can be a powerful antidote to the mental health issues affecting many people today. What is a cause you care about deeply? What is it that fuels your passion and makes you tell everyone about it? It could be anything from child welfare to AIDS relief or animal rights. Whatever it is that tugs on your heartstrings, it deserves your drive. It needs your voice. When you feel passionate about a cause, you owe it to the cause (and yourself) to get involved and make sure your voice is heard. You might think that the only way to make a difference is to donate money. While financial contributions are certainly welcome (and useful), volunteering can be just as helpful. Most non-profit organizations rely on volunteers to keep their programs running smoothly. If you’ve never volunteered before, you should get started. Volunteering has some fantastic benefits for the volunteer. Some benefits may seem obvious, but others are things you only discover once you’ve gotten started. Still not convinced that volunteering is for you? Here are just twelve ways it can transform your life. File this under the “obvious” category. When you volunteer, you are making a direct impact on the people affected by your cause. Whether you’re taking care of malnourished infants, fostering an abandoned or abused pet, or building a home for a family in need, you are making a tangible change in a life. But the impact goes beyond the obvious fact that you are helping people. You’re also providing hope. You are giving people the tools and skill sets they will need to create a sustainable future. When you rebuild a school after a hurricane, you are also helping rebuild the friendships that grow there. When you share a smile, you’re decreasing the gap between two people. One of the most essential things that all people need is connection. When you volunteer, you provide that for others (and yourself). While learning new skills to enhance your career outlook is one of the most valuable benefits of volunteering, so too is learning something new for the sake of…learning something new! It might be discovering how to carry out repairs on a home or build one from scratch, or it may be the opportunity to practice your second (or third) language skills with native speakers. Perhaps you’ll go behind-the-scenes to learn about animal conservation and species monitoring or see first-hand the social and environmental issues affecting communities around the world. No matter what volunteer experience you decide on, there will be countless opportunities to learn new practical, social and communication skills that will help you thrive as a human being. While a financial donation to an organization will help with existing needs, volunteering helps keep the organization and the cause afloat for the future. That’s because when you volunteer, you help raise awareness for the cause and the organization. You likely do this without realizing it by talking to your family and friends about your volunteer experience and the lessons you’ve learned throughout the process. However, you can also raise awareness through conscious effort. For instance, if you are going to travel abroad for your volunteer experience, you can create a fundraising page through Go Fund Me (or a similar website). Within the page, you can mention information about the charity you are supporting and why it’s important to you. You can also use social media to spread the word by posting pictures from the volunteer event to Facebook or Twitter. You can follow or like the non-profit, retweet posts from Twitter, or share important articles that are promoted by the organization. One of the most exciting benefits of volunteering is the opportunity to see the world and travel to places you might never have considered. While your friends could be off seeing the sights of Europe, you might be living with remote communities in rural Thailand or assisting new turtle hatchlings on an untouched beach. Volunteer abroad programs get you off-the-beaten tourist track to discover a side of the world beyond the brochures and have a culturally immersive experience. This might sound daunting to some, but you’ll have the support of team leaders and local guides as part of your placement and be working alongside like-minded individuals. Most volunteer abroad programs also give you days off to go sightseeing in the surrounding area and you can always extend your vacation before or after your placement to venture further afield. It’s truly the best of both worlds – being able to give back to those less fortunate and build life skills while getting to see the world at the same time. Want to transition into a new field or get your foot in the door of the non-profit sector? Volunteering can help you make the transition to a whole new career. Volunteering experience always strengthens a resume and proves your commitment to a particular cause, making it particularly beneficial for students who are nearing the end of their studies. But it also offers valuable experience for professionals, exposing them to real world situations that an office can’t. Perhaps you’re looking for more meaning in your career or doing something that gives back to others. Volunteering is a great way to take those first steps and make sure your new career path is right for you. Volunteering has also proven to be an important means of service learning in creating tomorrow’s corporate leaders. It teaches skills that may impact the decisions you will make on behalf of your company in the future and is just one reason why some companies choose to do team building through non-profit volunteer organizations. You already know that physical activity is good for your heart and health. When you volunteer, you (usually) get in a bit of a workout. You might even get in a Workout (that’s a workout with a capital W) if you are building new construction or doing other physical labor. But there are other health benefits of volunteering. If you’re volunteering outside, you’ll also have increased exposure to healthy Vitamin D from the sun’s rays. From a mental health standpoint, study after study (as well as a lot of anecdotal evidence) has shown that when we help others, we experience lasting happiness. There is great satisfaction to be gained in the knowledge that you gave to yourself when nobody forces you to do so. You can step back and see that you made a real difference for a cause you truly care about. Studies show that those who volunteer tend to have lower mortality and depression rates, as well as greater functional ability. Research conducted by the Harvard School of Public Health shows that “people who volunteered spent 38 percent fewer nights in the hospital” than non-volunteers, with other studies noted that volunteers had better health, more stamina and lower stress levels. It’s not only because volunteering is often of a physical nature (swinging hammers, trekking through national parks or working with energy-intensive kids), but the mental effects are also positive. Volunteering leads to greater personal satisfaction that you have made a difference in the lives of others and often helps to put your own life in perspective. In a world that is becoming more and more individualistic as people struggle to achieve financial success, the benefits of community are gradually being lost. Volunteering is a great way of regaining this and building community, whether it be in your neighborhood or a far-flung destination abroad. It helps to cultivate friendships as you work towards the greater good and reduces the isolation and loneliness felt by many people in the modern world. Social interaction is one of the great benefits of volunteering and has been shown by many studies to improve both physical and mental health. It helps to lower the risk of depression and anxiety while stimulating brain functions and enhancing the immune system. Volunteering helps to create stronger bonds between friends, family and coworkers as they are brought together to work for a cause that is bigger than themselves. This is a benefit you probably wouldn’t expect, but when you volunteer, you easily make new friends. And they will likely be friends for life! Volunteering provides you with an opportunity to get to know like-minded people. Think about it; you’re spending focused time with people who care about the same things that you care about, and who all have similar values. If you have a cause that you both care deeply about, it’s likely that you have other things in common as well. For instance, if you’re volunteering abroad to rebuild broken wells, not only will you meet a lot of people who care about clean water for everyone, but you’ll also meet people who love to travel and who want to experience other cultures. If you volunteer for an organization that plants trees in urban areas, you’re likely to meet people who care about conservation in the Rain Forest and who adhere to a plant-based diet. Perhaps the biggest (and least discussed) benefits of volunteering are the chances to break out of your daily routine and shatter your comfort zone. Whether you volunteer locally in your neighborhood or travel to the other side of the world, volunteering almost always comes with challenges that broaden your skill set and push your limits. Those challenges could be anything from public speaking to teaching a class or trying out a new skill. If you take the travel route to volunteering, it will also provide the opportunity to try new foods, experience new cultures, and meet people with very different backgrounds than you. Whenever you broaden your cultural horizons, you inevitably learn new ways to approach existing problems, new ways of looking at the world, and new ways to view a global issue. Travel expands your mind in a way few other activities can. It is one of the best ways to grow. How many times have you heard someone say that they wished they had more time in the day to get things done? Well, it might sound counter-intuitive, but research in the Harvard Business Review shows that volunteering can actually make you feel like you have more time! It’s similar to the idea that those who donate money to charity feel wealthier, with participants expressing that they felt more “time affluent” when they spent less time on themselves or wasting time doing nothing of a positive nature. Researchers at the London School of Economics found that the more people volunteered, the happier they felt. While “happiness” is a hard feeling to quantify, it’s likely a result of a combination of the above benefits of volunteering and how they resonate with each and every individual. So what are you waiting for? Find an organization involved in something you are passionate about and sign up. You never know just how much it will benefit you (and others) in the long run. As you can see, there are a lot of fantastic reasons to get out there and volunteer. It’s one of the best ways to make a real impact in the world. It’s also a proven strategy to become a happier, healthier, and more well-rounded person. With so many positive reasons to volunteer, it’s almost a form of self-care. 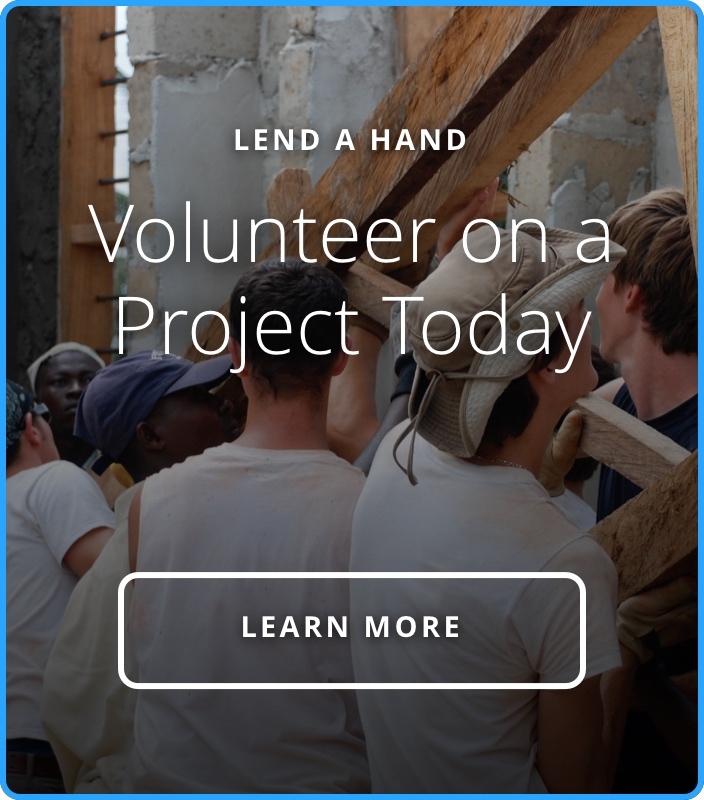 Visit Build Abroad’s Destinations page to learn where your next volunteering experience could take you!